Want to Know What You can do if You get Ovarian Cancer? With recent news and reports suggesting that there might be a link between talcum powder and ovarian cancer, many people are wondering what treatment is required if they were diagnosed with this disease. 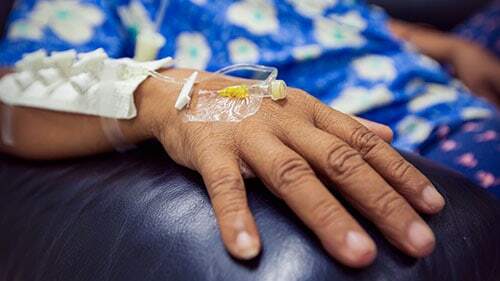 Here is an overview of some the most common courses of treatment for ovarian cancer patients but it is not exhaustive and only your doctor will know for sure what you will need. Although chemotherapy is the most recognized and discussed treatment option for cancer generally, with ovarian cancer, surgery is the most chosen option. With surgery, there are really two main goals. First, surgeons are trying to discover just exactly how much the ovarian cancer has spread. This is called staging. Second, surgeons will try and actually remove the cancer that has massed into tumors. This is called debulking. If the women is young enough, and the cancer has not significantly spread throughout the body, then doctors might be able to debulk it without taking out the ovaries or uterus. However, if doctors do not properly debulk or stage the cancer, then they might have to go in and do it again. Normally, a gynecologic oncologist is chosen to perform both of these procedures because of their training and stature in the medical community. In addition to or in substitute for one of the above treatments, doctors may prescribe an entirely different course of therapy. For instance, you could undergo hormone therapy. Doctors utilize hormone therapy to trigger or suppress chemicals, hormones, and other agents in the body in order to fight the cancer. Generally, this is used for some types of ovarian cancer (ovarian stromal cancer) but not others (like epithelial ovarian cancer). Additionally, you could possibly have to use radiation therapy to combat your disease. This mirrors x-ray procedures and employs x-ray particles to kill the malignant cancer cells. However, in modern types, this is rarely used in the context of ovarian cancer. Finally, your healthcare providers could recommend other targeted therapies to stop the spread of your cancer. This is a developing approach that tries to slow the malignancy from within, at the cellular level. Of course, all of these procedures can be used in combination depending upon the facts and circumstances of your case. If you are diagnosed with ovarian cancer, Rosenfeld Injury Lawyers LLC can help you figure out the source of your illness. Then, if it was caused by someone else, we can make sure you get compensation that you deserve. We can even do it on contingency so you don't have to worry about bills during the trial. Call Rosenfeld Injury Lawyers LLC today to realize the recovery that you need!